Yiheyuan Martial Arts, based in Leeds, UK, provides high quality training and down-to-earth information across a range of martial arts disciplines for practical self-protection, well-being and personal development. We aim to make authentic martial arts available to people all over the world to enable them to achieve their full human potential. We welcome your questions, views and feedback so that we can provide the best possible service to meet your individual needs. Yiheyuan School of Chinese Internal Martial Arts was founded in 1992 in response to requests from people wishing to find some peace and sanity amid the pressures and challenges of modern living. "Yiheyuan" can be translated as: "the garden where peace is cultivated." It is named after the garden of the Summer palace in Beijing. 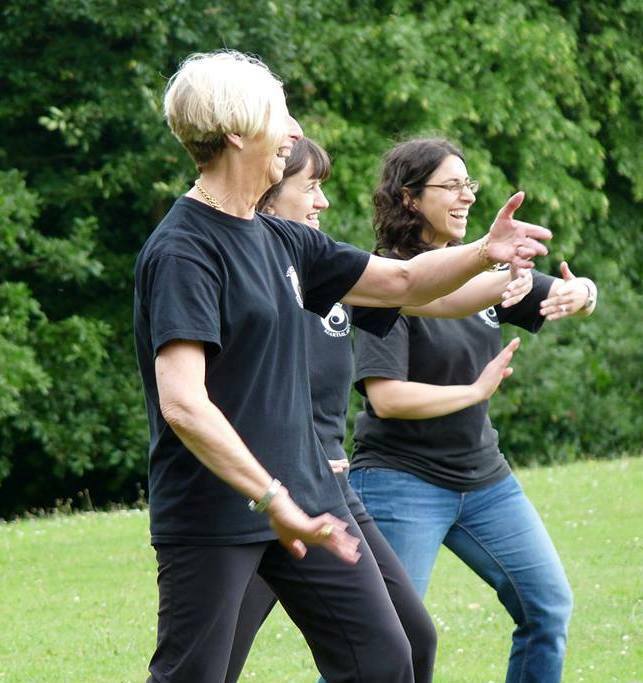 We teach a full Martial Arts syllabus in regular classes throughout the Leeds and Wakefield region of West Yorkshire, UK, including Tai Chi Chuan, Hsing Yi Chuan and Ba Gua Zhang. Within these classes, we aim to accommodate the individual needs and interests of all students, from practical self-protection skills and competition fighting to improved health and well-being and personal quests for meaning and self-realisation. We also provide private tuition, seminars, workshops, customised short courses, personal fitness training and a range of personal development, coaching and psychotherapy services. We have a team of qualified, experienced instructors and assistant instructors who provide a warm welcome and a non-judgmental environment in which all students can develop their skills, explore thier individual areas of interest and achieve their full potential. Lessons Observed: g's Tai Chi classes at St Gregory's. "This is an outstanding lesson because all students are making excellent progress as a result of inspirational teaching. The teacher is both talented and enthusiastic. Challenges for the group are differentiated according to ability and need. The teacher moves effortlessly between groups giving support and feedback which all students respond well to. All members of the group are highly supportive of one another." " This was an outstanding session with highly developed personalised learning that utilised peer support very well and in which students showed clear progress throughout the session. This was not a keep fit class as the students were learning life skills such as the development of memory and discipline. The session was very carefully planned and organised. Individual needs were catered for through the grouping of students and adjustments made for individual needs. The teaching was supportive and helped the students progress. Feedback from the teacher was encouraging. The teacher created a calm atmosphere that aided the learning. Excellent subject knowledge by the teacher and excellent connections with the theory and principles of Tai Chi - the protection element in particular. The teacher was passionate about her subject in a way that inspired the students. Health and safety was addressed eg how to do a single whip without doing yourself an injury." "I would like to congratulate you on your achievement in obtaining a Grade 1 for outstanding teaching and learning in your Summer term observation. By definition a grade 1 reflects that the observer left the room privileged that they have participated in a very special learning experience." "A mixed ability group of (17) learners with some beginners and others with more experience. The focus was on learning and practicing a sequence of moves, alongside a section of meditation and reflection. "Learners developing in self-confidence as they achieve the moves as well as exercising and developing physical and mental well-being. Learners can articulate the personal progress they are making and how the tutor's methods are supporting this. "Tutor shows excellent awareness of the needs and experience of each learner. Constructive positive feedback is constantly given and each learner knows what they need to do to improve. "This was an outstanding session. A mix of demonstration and practice of moves ensured that all learners were able to achieve objectives. Excellent questioning techniques helped to broaden learners' understanding both of the moves and their purpose. The learning of each member of the group was advanced during the session with a correlating impact on confidence and satisfaction. "Learners participating well and supporting each other's learning. Good relationships between tutor and learners. Oustanding subject knowledge." Yiheyuan Tai Chi "Master Form"
But mostly, of course, we have lots of fun!